Our variety of services allow us to better serve you and your individual needs. We have access to many new and revolutionary techniques with him in the field and are always evolving to make our office better work for you. Being able to formulate an effective treatment plan involves being able to properly evaluate and diagnosis each individuals condition. We employ the latest evaluation techniques and procedures to effectively evaluate each individuals specific condition and needs. Comprehensive Physical Evaluation: The initial encounter involves a thorough physical evaluation. These evaluations include, chiropractic/orthopedic/neurological evaluation. The examination is similar to what you may have experienced at your physician’s office. However, other evaluations are added to evaluate potential or existing structural problems, muscle tone, abnormal leg length issues’ etc. We pay special attention to structural issues such as posture evaluations, range of motion of the joints, particularly the spine, muscle tone and neurological balance. We also take into consideration dysfunction of nervous system and how it may affect the overall health and affect pain syndromes. Our goal is to find the root cause of the health problem, not just cover the symptoms. The patient also feels that extensive health and history questionnaires to search for any latent problems or pre-existing issues. Other specialized diagnostic procedures are performed depending upon the patient’s presenting symptoms, history or other significant factors. Digital Radiography: (Digital x-ray)-digital radiography is a form of x-ray imaging where digital x-ray sensors are used instead of traditional photographic film. Advantages include the ability to digital transfer imaging so that images can be transferred to other doctors or specialist with ease. It is better for the patient and that less radiation can be used to produce a similar contrast to conventional x-ray. This also allows the doctor to apply a special imaging processing techniques to enhance the overall display quality of the image. Digital Radiographic Mensuration Analysis (DRMA) -DRMA stands for Digital Radiographic Mensuration A Many times, this process is referred to as “digitized x-rays.” This is a test that Analyzes the angles and distances between bones in the spine uses a Computer and X-rays, which are a certain type of Radiograph. The purpose of the test is to accurately assess damage to the spine. Mensuration has been used by doctors for nearly 100 years to figure out when a patient’s spinal bones are misaligned due to injury, aging, or congenital defects. Mensuration compares a patient’s spine to a normal spine. For lawyers, DRMA provides objective, visual medical evidence of permanent injury. Simply put, DRMA helps patients prove their injuries in court. To introduce scientific evidence in court, it must be reliable and scientifically sound. Because DRMA uses decades-old mensuration techniques approved by the American Medical Association, or AMA, it is acceptable for use in court. Our clinic employs specialized testing equipment developed by P.R.O.O.F Preferred, a Kennebec company. This equipment will allow a physician to efficiently and accurately provide powerful and objective documentation. Range of motion testing and muscle testing our critical in developing treatment plans. Insurance companies and attorneys depend on the doctor providing accurate reports that demonstrate the need for care and document improvement objectively. This technology measures and documents the patient’s range of motion and muscle strength quickly and can accurately and easily quantify functional impairment and soft tissue injury. After a thorough evaluation is performed, our doctors will formulate a treatment plan to address the patient’s specific problems. Traditional Chiropractic Care: Our office has over 40 years of experience in the management of acute and chronic pain. Paulk and his staff had treated thousands of patients successfully. Dr. Paulk and his staff strive to stay abreast of the most cutting-edge methods and research. You can expect professional chiropractic services on every encounter. 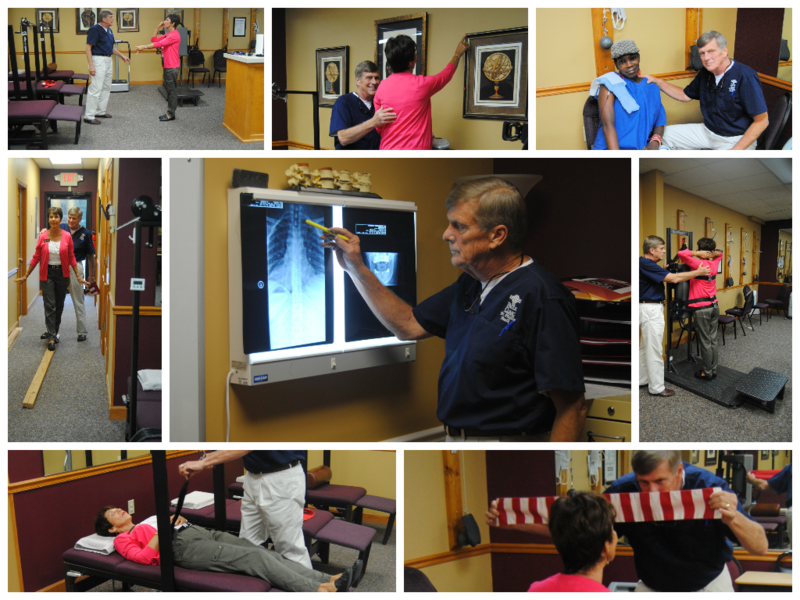 Dr. Paulk and his staff are proficient in many chiropractic techniques that focus on the spinal adjustment. This is what makes Doctors of Chiropractic unique in their approach to treating patients with spinal complaints. The chiropractic adjustment however, may not be the only procedure that we use in managing the patient’s care. Electrical muscle stimulation. During this chiropractic therapy, electrodes are placed on the skin that send light electrical pulses to different areas of the body with the purpose of reducing inflammation, curtailing muscle spasms and relieving back pain. In medicine, EMS is used for rehabilitation purposes, for instance in physical therapy in the prevention of disuse muscle atrophy which can occur for example after musculoskeletal injuries, such as damage to bones, joints, muscles, ligaments and tendons. Transcutaneous electrical nerve stimulators (TENS). The most common form of electrical stimulation, TENS unitsfeature electrodes that are placed over the painful area with the user having the power to control the intensity of electrical stimulation. It is believed that TENS helps block the transmission of pain signals along the nerves and release the body’s natural painkillers, endorphins. This unit can be used at any time pain occurs. Stimulated Nerve Function: Slow recovery of nerve function in damaged tissue can result in “dead” limbs or numb areas. Laser will speed the process of nerve cell reconnection to bring the numb areas back to life. Laser also increases the amplitude of action potentials to optimize muscle action. Ergonomics. During the course of chiropractic care, the chiropractor may recommend some modification such as a work station change that is applied at home and/or at work. The success or failure of obtaining patient satisfying outcome may be directly related to applying an ergonomic/job-related modification or a hobby-related irritating activity… When leg-length deficiency, flat feet and/or subtalar instability are present, the chiropractor may place a small heel lift in the shoe on the short leg side and/or prescribe corrective arch supports to help stabilize the pelvis. These methods may or may not be utilized in the course of a patient’s case management depending upon their specific needs. Non-Surgical Spinal Decompression: A computer-guided system that gently lengthens and decompresses the spine to provide lasting relief from chronic neck and back pain due to disc problems. This therapy has proven effective for treating disc herniations in the lower back and neck, degenerative disc, stenosis and other chronic neck and back conditions. Spinal decompression is proved extremely effective in treating sciatica as well as arm pain numbness and tingling.